ON THE WALL: Kingston’s first street art festival! 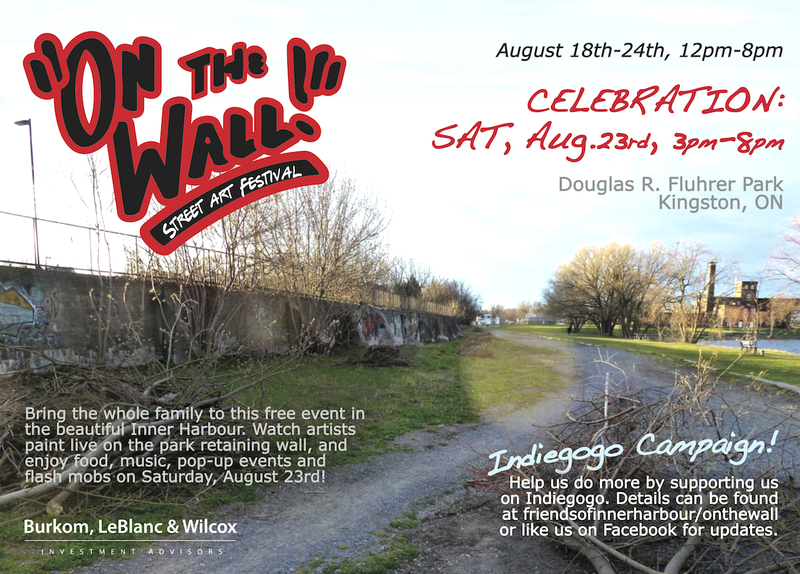 On August 18th, artists will begin painting, drawing, and building artworks on the retaining wall that borders Doug Fluhrer Park, Kingston. They will be creating large-scale works on the wall from noon to 8pm all that week, from Monday to Sunday. Members of the public can watch them work at any time that week, and on Saturday, August 23rd, a celebration will be held in the park from 3 – 8pm. Join us for food, music, pop-up events and flash mobs. It’s a fun, free, family event! On the Wall aims to become an exciting annual event where the work of local Kingston street artists as well as artists from the broader Canadian artistic community can be celebrated in a unique waterfront venue. We need your support to help us raise $6000 that will go towards covering the expenses of the Artist Celebration Day on August 23rd. Your donations will go towards: honorariums for performers, stage, chairs, tables, and a solar powered sound system. With the donations we would like to recognize the contributions that artists make to our society. If we surpass our goal of $6000, it would allow us to increase the artists honorariums. With 40 artists currently scheduled to perform on August 23rd, even with a $6000 goal they would be coming away with very modest compensations. With a donation of $25-$99 you will receive one of the t-shirts shown below (to be picked up at the event), one sporting the branding design for this years festival and the other bearing a special indigogo design.